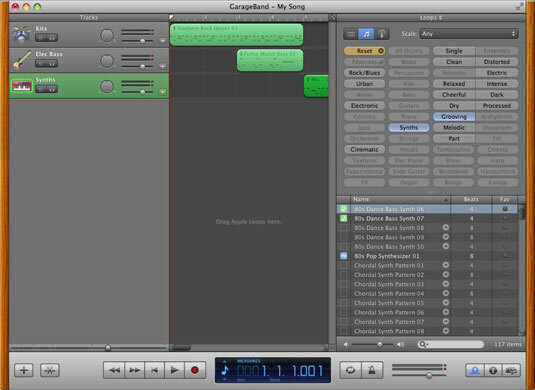 Using your MacBook, you can add loops to an empty track in GarageBand to build your song. You do that by listening to loops and making selections from the Loop Browser — Apple provides you with thousands of loops to choose from, along with more you can buy — and photos from your Media Browser. Click the Loop Browser button (which bears the loop symbol) to display your collection. Click the button that corresponds to the instrument you’re using. Click the Kits button in the Loop Browser, and a list of different beats appears in the pane at the bottom of the Loop Browser window. Click one of the loops with a green musical-note icon. Go ahead; this is where things get fun! 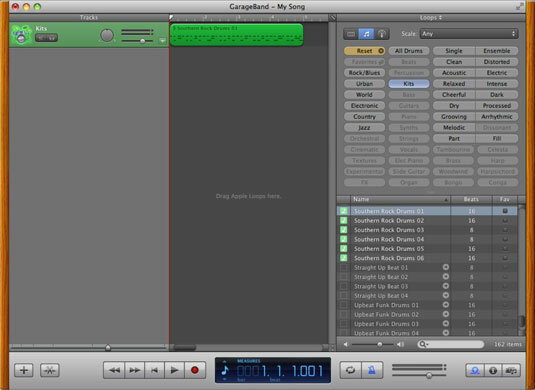 GarageBand begins playing the loop nonstop, allowing you to get a feel for how that particular loop sounds. When you use only software instruments in a track, choose only software instrument loops, which are identified by a green musical-note icon. Click another entry in the list, and the application switches immediately to that loop. If you want to search for a particular instrument, click the Search box and type the text you want to match. 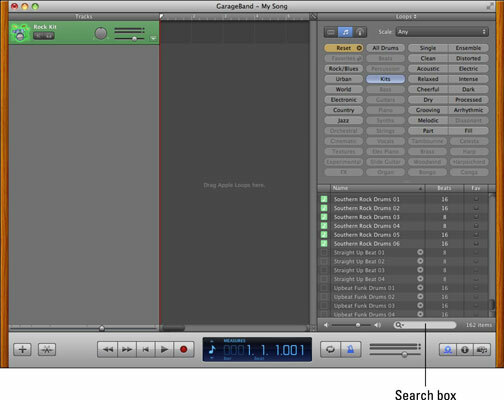 GarageBand returns the search results in the list. Scroll down the list and continue to sample the different loops until you find one that fits like a glove. For this reporter, it’s Southern Rock Drums 01. Drag the entry to your Rock Kit track and drop it at the very beginning of the timeline (as indicated by the playhead). If you want that same beat throughout the song, you don’t need to add any more loops to that track. However, if you want the drum’s beat to change later in the song, you would add a second loop after the first one in the same track. For now, leave this track as is. Whoops! Did you do something that you regret? Don’t forget that you can undo most actions in GarageBand by pressing the old standby — cmd+Z — immediately afterward. Each track can have more than one loop. Loops don’t have to start at the beginning; you can drop a loop anywhere in the timeline. You put loops on separate tracks so that they can play simultaneously on different instruments. If all your loops in a song are added on the same track, you hear only one loop at any one time, and all the loops use the same software instrument. By creating multiple tracks, you give yourself the elbowroom to bring in the entire band at the same time. It’s über-convenient to compose your song when you can see each instrument’s loops and where they fall in the song. Click the Reset button in the Loop Browser to choose another instrument or genre category.